We Provide Quality Service at an Honest Price! 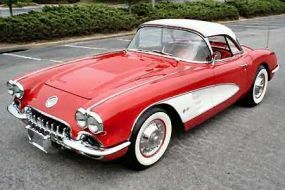 For the past forty-one years, the name Corvette Specialists has been known for reliable automotive service, expert knowledge on classic vintage and modern Corvette models, and quality customer service. Since our founding day we have expanded from exclusively repairing and restoring Corvettes to also offering our customers a comprehensive choice of services for their GM model cars, SUVs, and light trucks. Our ASE-certified automotive technicians can help you with simple services like an oil change or A/C repair to more extensive services such as a complete engine overhaul or transmission repair. Our work has received top awards including NCRS, Top Flight and “Best of Show” in numerous car shows, to name a few. Give us a call today to schedule an appointment and we can help diagnose any issues your car may have as well as perform maintenance services to keep your car running like a champ!